Which Snow Tires Work best on my Pickup? While most people think of pickup trucks as vehicles that can easily traverse through the worst winter weather with standard factory tires, this just isn’t the case. Just like cars and SUVs, trucks need snow tires in order to get through snow and ice, even if these trucks are heavy 4×4 beasts. If you do not have snow tires on your pickup truck then you will have the same amount of problems out on the road as everyone else, regardless of whether or not you’re driving in 4×4 mode. In the article below we’ll discuss some of the very best rated snow tires for pickup trucks. These tires are hands down some of the best out there for pickup trucks. They range in price from $115 to $190 per tire, which is a great rate considering what sort of performance they pack. The tire is made of a highly advanced silica rubber composite that is extremely flexible even in super cold snow or ice. This means that the rubber will not stiffen up when it gets cold and therefor it won’t cause you to slip and slide all over the road. 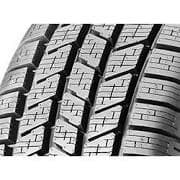 Priced at between $119 to $185 per tire, these Winter Dueler’s feature a highly advanced directional tread pattern on each tire that will help your truck stick to the road even while driving through ice, snow and slush. The tread pattern features a zig zag type of contour that directly bites straight into thick ice and snow, unlike many other tires that will force your pickup to ride on top of the snow or ice. If you’re looking for the very best in winter tires, then this is a model well worth the price. Priced at $200 to $210 per tire, these high end treads are definitely worth every dime and penny. The tread patterns on these Pirelli’s feature multiple groves and tread pockets that are scientifically created to channel out snow, water and icy slush. The tires also have sipes that provide vastly improved winter tire traction. What is also awesome about these tires is that they are built for not just urban travel on snowy or icy streets, but they also work great for off-roading too. You’ll find that equipping your truck with these quality treads will pretty much mean that you can drive anywhere with ease.